Singing is an important part of Wilshere-Dacre life. All children take part in a weekly Singing Session run by Mrs Parker where they learn a variety of songs, old and modern. She sets the bar high and is not shy of a challenging number to learn. The children learn to sing together as a group and how to adapt their voice to different songs. 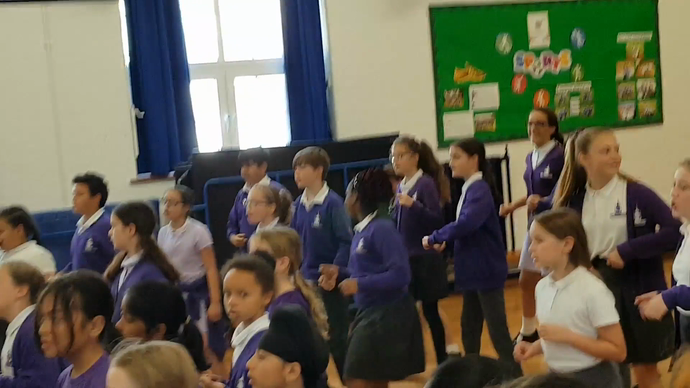 They learn how to sing in both in unison, in rounds and in different harmonies and there are often opportunities for solos (or group 'solos') in front of the whole school! Songs are often chosen to complement the school calendar and where possible any events that might benefit from singing together, for example on Red Nose Day, Harvest, Remembrance Day, Sports Relief and of course Christmas. Mrs Parker also welcomes any song requests and is very happy to try to find or write an arrangement of a song of your choice.